On Sunday, May 20th, the day our Holy Orthodox Church celebrates and commemorates the Sunday of the Holy Fathers of the First Ecumenical Council of Nicea, the parish of St. Nicholas Church in Monroeville, PA, also celebrated its feast day and Slava, the Transfer of the relics of St. Nicholas the Wonder-worker from Myra (today's Turkey) to the city of Bari (today's Italy). Holy and Divine Liturgy was served and celebrated by the host priest, Very Rev. Fr. George Veselinovic together with visiting clergy the Very Rev. Fr. Andrej Aleksejev, Very Rev. Fr. Rodney Torbic, Rev. Fr. Branislav Golic and the Very Rev. Deacon Jovan Anicic. Following the festal procession around the church, the service of blessing of the slavski kolac/festal bread and koljivo was performed. Mr. and Mrs. Danilo and Miljana Zdrale, benefactors of the parish, served as honorable kumovi. "Christ is in our midst! He is and shall be!" was proclaimed by the faithful gathered - a record attendance for Slava - 350 people. Led by Mr. and Mrs. Nikola and Mary Jokolo, members of the church Maintenance Committee, St. Petka Kolo, choir, Tamburizan's, Men's Club Karadjordje and St. Nicholas parishioners took part in the preparation and serving of a traditional Serbian slava meal. The beautiful meal was served in traditional Serbian style in the church hall for all of the guests. The Very Rev. Fr. Dragan Filipovic and Very Rev. Fr. 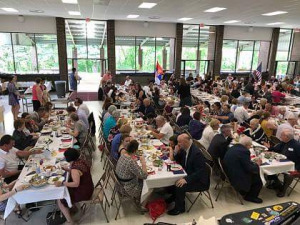 Joe Cervo, clergy of the Greek Archdiocese of Pittsburgh, were present for the festal Slava meal and program, as well as clergy of the Serbian Pittsburgh deanery, Very Rev. Fr. Rajko Kosic, Rev. Fr. Dejan Barac and Rev Sasa Nedic. Their love and support to the St. Nicholas parish family did not go unnoticed. The parish was pleased to also host guests from Windsor, Cananda, who travelled to Monroeville to participated in the St. Nicholas Tamburizan concert over the weekend. Parish Executive Board President, Borislav Bati Bajich, served as Master of Ceremonies for the slava program. Mary Ann Tomich, also a benefactor of the parish, accepted the honor to be kuma for next year's slava. The St. Nicholas Tamburizans took part in the festivities, performing on stage to the delight of all. The high school senior graduation students, Courtney Mireles, Dusan Saula, Milos Jagnjic, Anna Steen, Mira Steen and Nicholas Wright, were honored and recognized by their Sunday School teacher, Protinica Karen. She expressed her great joy to have shared the past year with them, and encouraged them that as they enter adulthood, to strive to always follow and serve Christ. 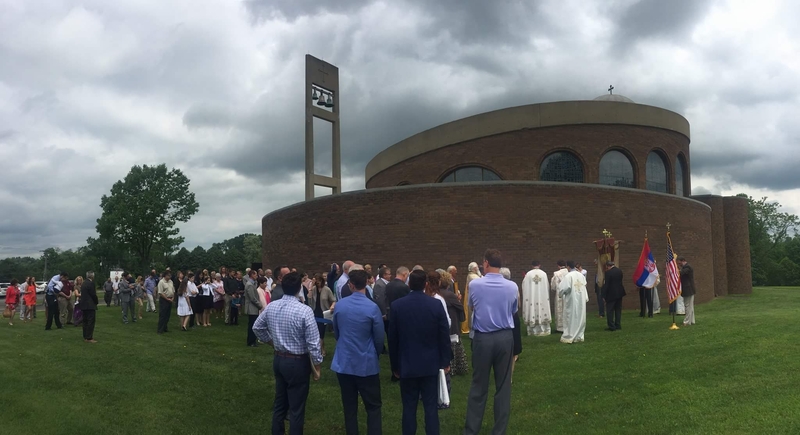 Each graduate was then presented with gifts, honoring their accomplishments; it was a special and beautiful day for the whole parish. Fr. George Veselinovic extended blessings and regards from our Father and Bishop Irinej. He thanked and acknowledged this year's kumovi, Mr. and Mrs. Zdrale. He also acknowledged and thanked Mr. Jim Banda, a great benefactor and kum of the church, for his love and sacrifices for Christ and His Church. Fr. George also thanked the parishioners, beautifiers and supporters of the St. Nicholas parish for their work over the past year since Fr. George's appointment as parish priest. He then encouraged those present that this first year is only the beautiful beginning of much more work to come - all in the oneness and unity for the Glory of God and His Holy Church.